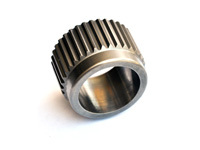 CNC machined from aerospace grade steel billet material, the BC oil pump drive gear for the 2JZ engine platform is stronger and more durable than the OEM cast gear. No need to hassle trying to get the factory gear off of the OEM crank. The unique combination of design, metallurgy and engineering come together to deliver what drivers expect from high performance Trimetal engine bearings. Designed to withstand higher RPM conditions, ACL Race Series Engine Bearings are available for many of the popular 4, 6 & 8 cylinder applications. ARP uses premium grade 8740 alloy that is heat treated to 200,000 p.s.i. This procedure ensures complete heat penetration and the results are far superior to those lesser quality studs from other manufacturers who just dump pieces in a basket and hope for the best. Following heat treat, each stud is centerless ground to make it as close to perfectly concentric as possible. This procedure involves about ten very slight cuts and results in an exceptionally straight part. ARP studs are thread rolled after heat treat which gives them about 1000% better fatigue strength than studs that are threaded prior to heat treat (a very common industry practice). It costs more to do it this way because it�s tough on tooling but the results are well worth the extra effort. ARP main studs eliminate main cap walk and fretting as well as protecting the threads in your engine block. All kits come complete with hardened parallel-ground washers and high quality nuts. Manufactured from 8740 chromoly steel, heat-treated in house to 200,000 p.s.i. tensile strength and precision J-form threads rolled after heat treat to create a fastener that has threads 1000% stronger than OEM produced studs. A must for high horsepower, high rpm engine applications. 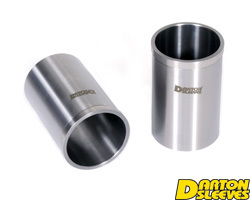 The Darton Dry Sleeve Kit is available for many series of 4, 6, and 8 cylinder import and domestic engines and provides for maximum bore sizes and boost potential. BC gaskets are made in Japan and deliver the ultimate sealing capability even at extreme boost pressures. Individual die cut layers of stainless steel with superior consistency compared to other leading gaskets. These inferior brands are constructed with too high profile of beads which is prone to fatigue, losing the spring effect in a relatively short period of time and consistency of sealing pressure, resulting in leakage. BC gaskets are pre-coated stainless steel with a 0.2 micron consistent layer of Nitrile rubber that completely fills the cylinder head surface. Even a newly resurfaced cylinder head and/or block has a surface finish or roughness between 10 to15 microns and this Nitrile rubber completely seals the surfaces at operating engine temperatures, unlike the FKM type which is not suitable for filling the surface roughness because the material has too high of heat resistance. Basically the FKM does not melt to fill into the surface roughness providing the proper seal.